All our acid free card inserts are completely archival safe and used mainly to place in our pockets to enable two certificates, documents or photographs to be placed back to back. They also act as a support for fragile documents and can also allow descriptive labels or text to be placed around items. Our acid free card is available in foolscap, A4 and A3 and in a range of colours white, black, burgundy. 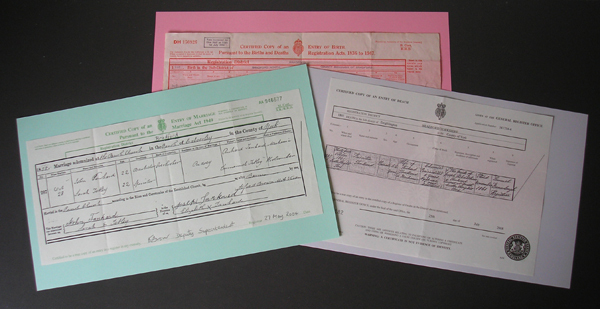 We also stock acid free card in foolscap and A4 in the BMD certificate colour range to use with identification - pink for birth, green for marriage and grey for death. 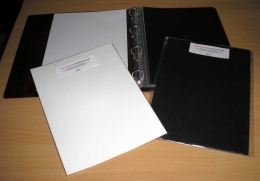 These are extremely useful to identify your certificates within our binders. We offer a range of acid free adhesive, tapes, pens and even labels - again all archival safe products.